› Author AffiliationsWe thank the National Natural Science Foundation of China (No. 21462021), the Natural Science Foundation of Jiangxi Province of China (No. 20161BAB203086) and Key Laboratory of Functional Small Organic Molecule, Ministry of Education (No. KLFS-KF-201704) for financial support. The heterogeneous cascade addition-oxidative cyclization of nitriles with 2-aminopyridines or amidines was achieved in 1,2-dichlorobenzene or DMSO at 120–130 °C by using a 1,10-phenanthroline-functionalized MCM-41-supported copper(I) complex [Phen-MCM-41-CuBr] as the catalyst and air as the oxidant. The approach was used to generate a wide variety of 1,2,4-triazole derivatives in mostly high yields. 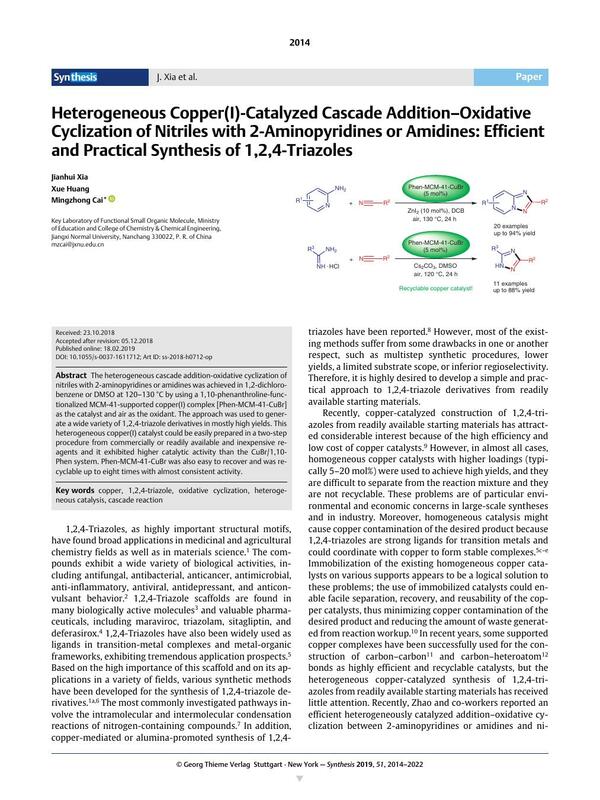 This heterogeneous copper(I) catalyst could be easily prepared in a two-step procedure from commercially or readily available and inexpensive reagents and it exhibited higher catalytic activity than the CuBr/1,10-Phen system. Phen-MCM-41-CuBr was also easy to recover and was recyclable up to eight times with almost consistent activity. Supporting information for this article is available online at https://doi.org/10.1055/s-0037-1611712.